Of course everyone knew where Joe Benz was...they were all dying to get in to his place of work! (rim shot)...thank you, I'll be here all week...try the fish! Scott, no I didn't know that he threw a no hitter. I just looked it up and saw that it was actually the first White Sox no hitter that allowed a run (not sure how many in mlb where that has happend). 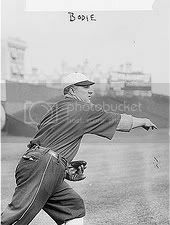 Also realized that the 1919 team had 3 pitchers to either have thrown or that would throw a no hitter (Benz, Cicotte and Robertson and all three were caught by Ray Schalk)...pretty cool! Also, I did not actually see the scrapbook, just know that it was pasted into one, but your date range guess sounds about right based on strength of signature. I believe that there have been 21 nine inning no-hitters pitched since 1893 (when the pitching mound moved to the 60' 6" modern standard) where at least one run was allowed. Additionally, there have been 3 eight inning unofficial no-hitters thrown that allowed have allowed at least one run. Last edited by Scott Garner; 07-19-2011 at 05:19 AM. picked up my 2nd Paul Thompson original photo in the past 2 weeks(this one is good size too just about 7x9).......selling my Buck Weaver 1914 postcard if interested, as my focus has shifted toward photos. Last edited by Shoeless Moe; 08-25-2011 at 09:41 AM. thanks! Was there another Collins posted? 1913 Fenway. Would any of the Chicago gurus know who the dark skinned player may be? 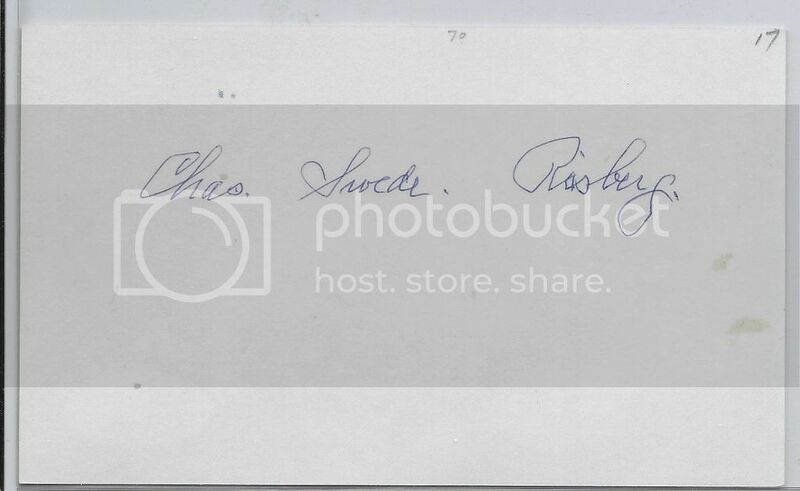 Black Sox fans that may not own a couple of the Eight Men Out signatures yet, Huggins and Scott will have Eddie Cicotte and Chick Candil signed 3x5's in next month's auction. I felt like they needed to be rewarded with free advertising after the swiftly pulled their ACE authenticated items! I just caught this thread again and don't know who the player you are asking about is. I'll do some more checking, but to my eye, that's Ping Bodie in the foreground. Found this cool ticket stub, actually found 2, putting 1 up for sale, keeping the other. Only post banishment ticket I've ever seen from any of the 8. Well from a league they played in I should say. Last edited by Shoeless Moe; 06-03-2012 at 08:07 PM. Too bad you can't assert it FOR SURE to a game he played in. Still, a cool piece indeed. Good luck w the auction. Yeah I was the first bid on it, it's still a cool piece if one of the Black Sox played in it or not. I've posted this before, but this thread is so cool, I thought I'd add it. It is the bat that started me collecting pre-war stuff many years ago. and the story behind it - share it with others if u like - pretty amazing find! Here are a few of Attell . Sorry on the small pic. still new at this. Last edited by attellfan4life; 06-05-2012 at 03:23 AM. Last edited by Runscott; 06-04-2012 at 01:51 PM. I'll keep it going with one from earlier this year but never added here - the 1916 squad, posing with a postal workers' convention on the field at Comiskey. I'm waiting for someone to post that 1919 Senators program, featuring the Black Sox and Walter Johnson pitching - from last week's Legendary auction. Did you notice that Eddie Murphynoted that he had two different colored eyes? I noticed it since I have one blue and one green and my dad has one blue and one brown (like David Bowie). No, I hadn't noticed that. That's actually pretty cool when you see stuff like that. I also like where it asks "color hair before greying". "Field Of Dreams" was on again last nite. Haven`t seen it for a while, hard to believe it`s 25 years old. Reminded me of playing catch with my father and of course the Great Joe Jackson. Bye the way, is "have a catch" instead of "play catch" a more common phrase in different parts of the country? Game one of the 1919 World Series, 8th inning - Heinie Groh slides under Buck Weaver's tag at third, Lowdermilk backing up the play at left. Last edited by Runscott; 11-30-2014 at 01:16 PM. That photo is used for the cover of Luhr's book, The Great Baseball Mystery. Thanks for that info. My copy has stamps and slugs all over the back. The earliest stamp is 'OCT 6 1919', but there are also two from 1994 and one from 1988. It was well-used by publications. I've been watching for 15 years now. I've seen 3 of these, one being this one, the other 2: one in a Chicago Restaurant about 6 years ago I was in and made an offer to the owner who declined. Saw another one after the fact at auction that went for a $1000 unframed (however in better condition then the one I just picked up). Mine came very nicely pre-framed. Just THEE Best Headline/Paper I've ever seen, finally snagged one. All "8 Men out" are shown. Mother of god that pennant !!!!!!! while searching through things, as Im new to the website, I thought I would post in this old thread as it is my main area of collecting. Over the years I have bought and sold many items, some I wish I had never sold (a Morris Rath signed GPC for starters). These are some autographs I currently have, including two 1917 Sox. 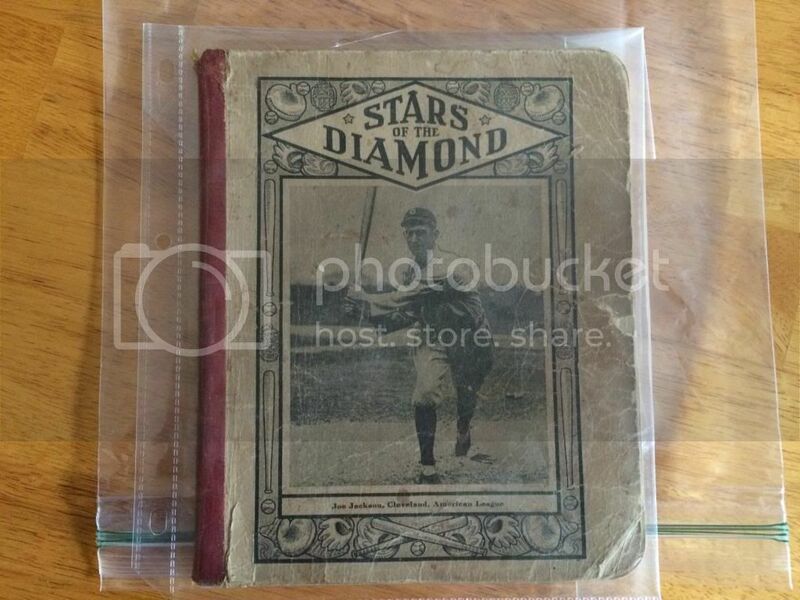 Very nice items Thomas, please feel free to "post away" as there are many Black Sox fans on the site that enjoy seeing pieces related to the team. Picked up a nice 1925 original wire photo 5x7 of Harvey McClellan that ran for his obit. 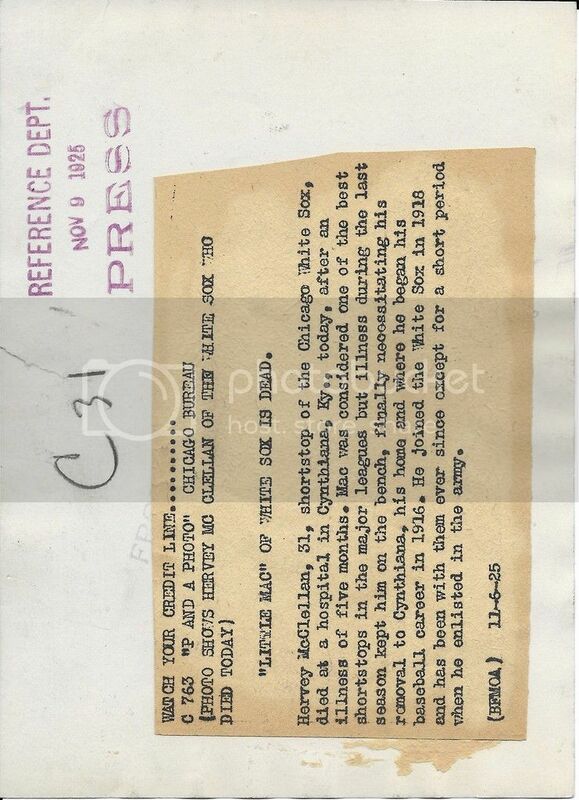 Discoloration on the front due to glue used on the back to glue piece of paper with information relating to the article. Great picture of Harvey, Thomas, and as you said tough auto. 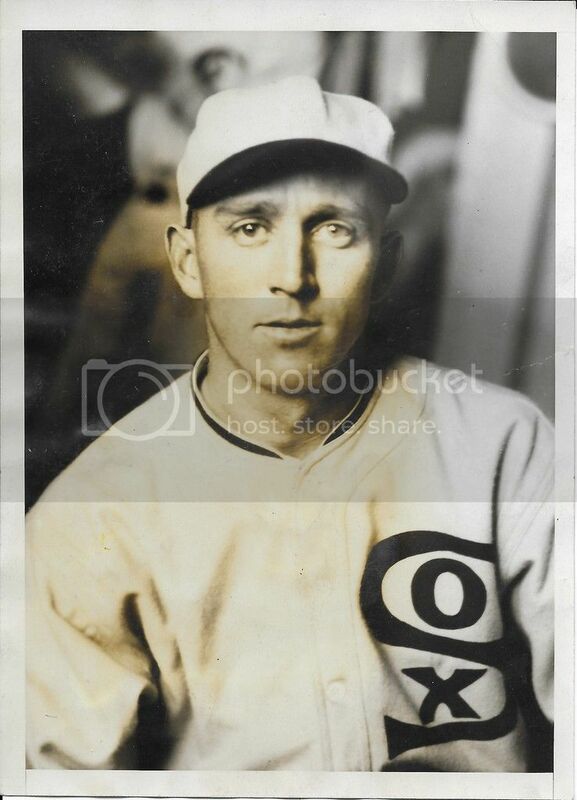 Thought fellow Black Sox collectors might like to check out these recently purchased EBAY items. Really like the Ruth/B Sox connection with these pics of the band performance being within a week of Landis ending ending the famed B Sox playing careers. I just did an illustration and story of McClellan for a book I'm writing about Kentucky baseball. Though in many places he's called "Harvey," his real first name was "Hervey." He was from Cynthiana, about halfway between Cincinnati and Lexington and did his WWI Army service at Fort Thomas right down the street from me. Poor guy had his career and life cut short by stomach cancer. 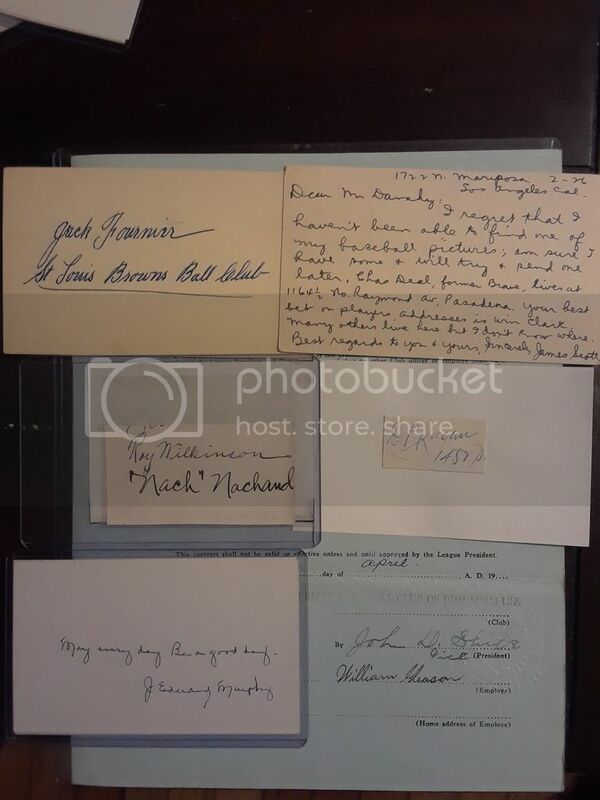 Here is a McClellan signature from a multi-signed album page. I can never remember which one was correct Hervey or Harvey thx for the reminder! The Swede, in a contact print by Charles Conlon. I think this portrait isn’t as strong as it could be, and not nearly as strong as a portrait he took of Gandil, probably on the same day. If you have the Gandil print (or Cicotte), please contact me! I have had a Swede Risberg signature in the past on a 3x5, but I have had my heart set on one of the fabled Van Buskirk 3x5 signatures. Final was able to purchase one this past week (JSA cert too). A few of the Buskirk's have little imperfections as Risberg was in the hospital and signed, rumor has it, 100 index cards overnight. This one has one with the "i" in Risberg. If anyone has an extra Felsch signature laying around or that Bill James signed contract from REA a few years back...hit me up!